You've found the “U.S. Orpington Chicken Breeders” page here at Hobby Farm Wisdom! If this is the first time you have visited our site: Welcome! Orpington chickens are a breed developed in Orpington, England by William Cook. His goals was to create a hardy, quick growing bird that was both a good egg layer and provided desirable meat. He found success by crossing Minorcas, Black Plymouth Rock and Langshans. The Orpington chicken is an excellent egg layer, producing 175 to 200 large to extra-large brown eggs. They also make first-rate meat as broilers, roasting chickens and old fowl. Further breeding has been done in order to enhance the productive traits of these birds. In doing so, many color varieties have been established, including black, white, buff, jubilee/speckled, spangled/mottled, blue and cuckoo. 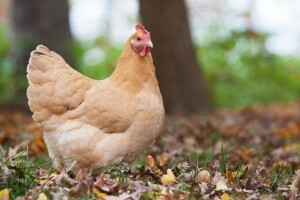 Orpington chickens are larger than many other breeds but are very friendly and easily handled.